Olivia spent the night with her Lovey not too long ago! She had so much fun and got to do a special craft. She is really into crafts right now. I was so excited when she told me it was sewing!! 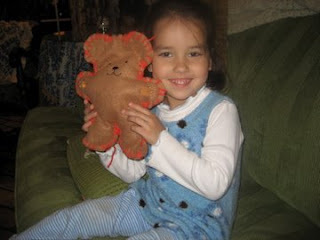 It was a bear that you sewed around the edges and then stuffed! How fun! She named him Paddington. Which could be because they've been reading A LOT of Paddington bear stories lately at school. 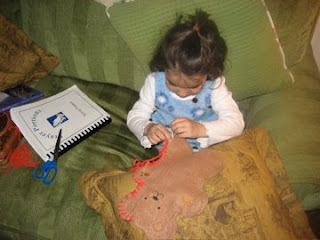 Maybe the "sewing gene" will be passed to her as well!! My mother and grandmother were also sewing women! Hey, you've got to start somewhere! Um, Did I Really Just Do That?